Tonight we made homemade pizza dough in the bread maker for the first time and holy cow it was delicious! I made a whole wheat dough recipe that I adapted from Cooking Light. Instead of going through the processes of covering, rising, kneading, punching which is what this recipe called for, we put the dough in our bread maker and set it to the dough setting. Easy peasy! Once it’s done in the bread machine, I baked it in the oven with all of the toppings I had on hand and waited, waited, waited impatiently. The crust came out pretty thick which was delicious, but I read the recipe once we were done stuffing our faces and read that it was actually supposed to make two 12 inch pizzas. This would make for a thinner crust which is usually what I prefer! But I am not complaining, because this was one delectable pizza. I enjoyed and savored every single bite. MMMMMMmmmmmmmmmmmmm! In bread machine add water and oil. * Recipe called for cooking spray but I omitted because honestly I didn’t think you needed to coat a pizza stone. I was wrong. Dough was sticking a little bit once I took it out of the oven but I used a spatula to loosen it right out. Next time I will use cooking spray, then corn meal. I will definitely be making pizza crusts homemade from now on in the bread maker. Winner winner! The rest of the night will consist of hanging out with my boys and watching a little bit of the Golden Globes. Have a great night everyone! 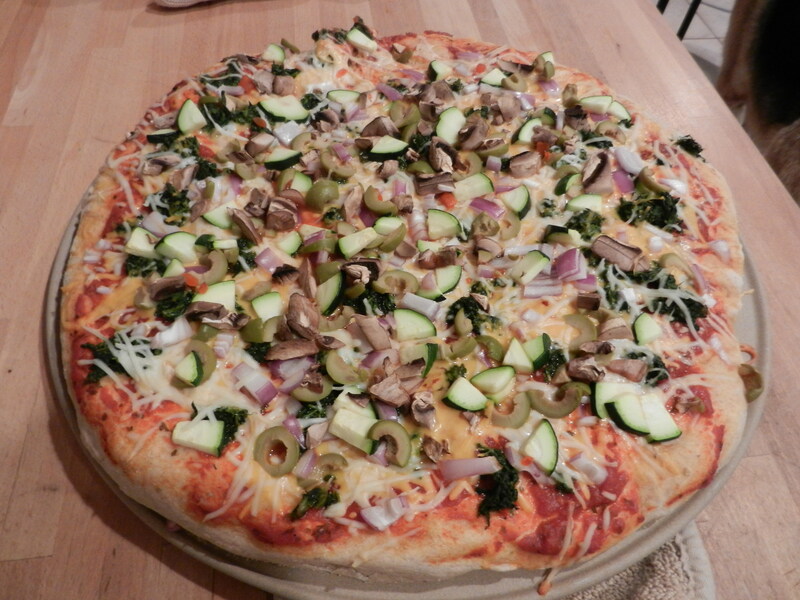 This entry was posted in Dinners, Recipes and tagged bread machine pizza dough, homemade pizza by Melanie. Bookmark the permalink.